We’re lucky here in Dedham to be amongst such renowned natural beauty in the Dedham Vale, which has inspired artists for over 200 years, including Sir Alfred Munnings who made his home at Castle House in Dedham 100 years ago this year. Castle House is now The Munnings Art Museum and a good 15 minute walk from the pub. It owns the largest collection of paintings by Munnings in the world and this year it’s displays are particularly interesting. 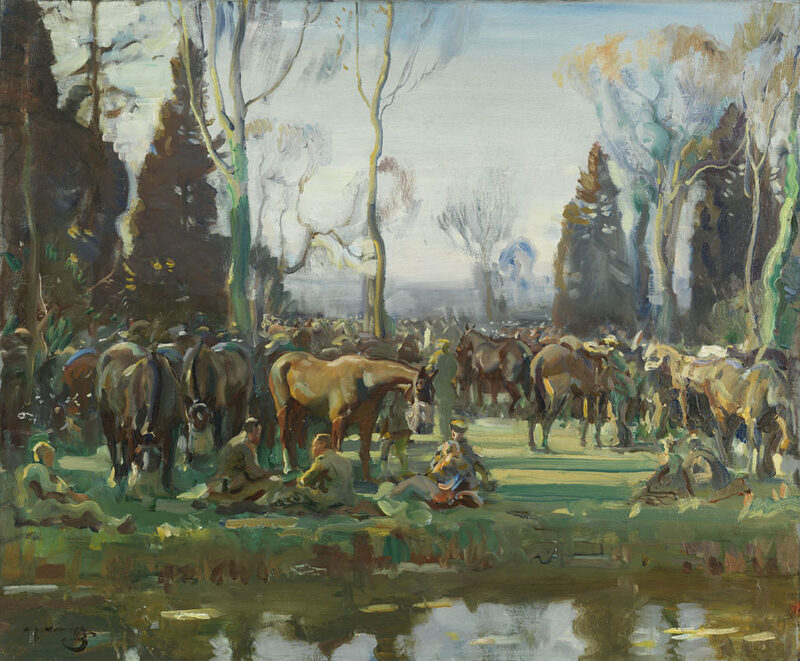 In 1918 Alfred Munnings was appointed as a war artists in France for the Canadian Cavalry Brigade and later for the Canadian Forestry Corps. At the war’s end, his paintings from France were brought by the Canadian government and are now in the collection of the Canadian War Museum in Ottawa. In the centenary year of their first exhibition at the Royal Academy, London in 1919, the Munnings Art Museum is privileged to have on loan from Canada, 41 of these war paintings. To celebrate this, we’re giving away tickets to The Munnings Museum as part of our two night Spring Offer. It is a rare opportunity to see these works, alongside sketches and paintings from The Munnings Art Museum’s own collection. We know many of you who have stayed have visited The Munnings Art Museum so we’re very much hope you’ll come again to see these significant and evocative paintings. Book under our Spring Offer and enter Munnings Tickets in the comments box. We’ll do the rest. (note the museum is closed on Mondays and Tuesdays). A 5-7 course tasting meal in place of normal dinner one evening.